Side story: Yume-iro Pâtissière: Mune Kyun Tropical Island! Yumeiro Patissiere is not a series with a unique storyline but it is definitely enjoyable and you would not regret watching it. In my opinion, the first time I watched it, I find it a tad bit boring because this movie contains A LOT of fillers but the story progresses as you watch more episodes so do watch MORE episodes cause they will definitely get you hooked onto it. It was a so-so story, not an original story (Think: Gakuen Alice) A girl who has no talents in cooking except eating but she does has an incredible palate comes into the story, recommended by a famous Patissiere and she goes to school and tries to get accepted. But the story does get interesting as you watch more - to me, the part where they joined the Cake Grand Prix was REALLY interesting. It was so intense that I sometimes shudder at the thought of who won and who lose cause it is SO unpredictable that it makes the viewers wonder what will happen next. There is a little romance in the series which makes it really cute! At first, I thought the addition of the fairies were a little silly since all they did was just chant a few noises here and there but eventually, I noticed they do play an important role in cheering the Team up. I liked the chibi fairies and they were really cute especially Caramel-desu! Love her! And Cafe-kun of course. The concept of the Sweet Princes were interesting as well. I LOVE the songs for the opening and the ending but I have to admit, the ending was more catchy :D Don't you DARE forget the background music (OST) They were INCREDIBLE. I loved the background music the most. Probably the best part of the series. You should take note of the background music from time to time asit really fits the mood. For example, the sad ones would be really sad. Try listening - it has a soft melodic touch to it. Sometimes during the competition part, they play those "nervous" music which is really a nice touch to the nervous mood of the episodes. I like the art. They were clean and crisp and the background is really nice. I'm a sucker for nice background art and it's important for them to look good. As for the desserts - DUDE, have you ever watched Yumeiro Patissiere and NOT get hungry? Cause I always tend to get hungry when I watch them. And I crave for chocolates - A LOT. Amano Ichigo is very much alike as most female protagonists - optimistic, cheerful, tries her best in everything although she has no skills - they're quite cliche aren't they? But I love them because in my everyday life - each time I'm about to say "I can't do it" I would always think of these characters and wonder to myself - if they can, I can as well. So these characters are a really great addition to the story. Did I mention how much I love Hanabusa-kun's character? He is SO darn funny. Watch the series further to know more of his character. You would definitely love him. As for the rest- the sweet spirits, they were really cute as well! Cafe-kun is super adorable. Koshiro-san - one REALLY annoying girl that you would probably hate yet love because she's a great supporting character in the series. Enjoyment: 9/10: Overall, it's a great watch which makes me happy because looking at how hard someone works just to be on top and even though it ain't reality, it's always good to step out of reality once in a while and enjoy yourselves watching light-hearted anime. 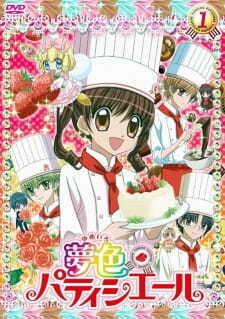 Yumeiro Patissiere was one of those animes that even though they aren't even that great, it was enjoyable. To be fair, I'm not very picky when it comes to anime, certainly not critical with it, but in this case, I think Yumeiro Patissiere is one of those animes that you can look past the imperfections and really just allow yourself to enjoy it. Almost no anime now-a-days has an original story line, so I think it's fair to say that while Yumeiro Patissiere doesn't have a very original or particularly strong story line, it deserves a decent score of 8, because at least it was easy to follow. Yes, there were many fillers, and yes, the excessive amount did get annoying at times, but some of the filler was almost like a look inside the characters' minds! Just seeing how they interacted within filler episodes shows how they act, regardless if anything important to the plot is going on. The plot itself is basic, Amano Ichigo, a girl with no talent what so ever transfers to St. Marie, a prestigious school for sweets making, and well, of course she isn't very talented, so nothing particularly good can happen! However, learning to overcome obstacles (like the Cake Grand Prix) is what this series is all about, and that's all it really takes! There's the plot. Simple. Sweet. Easy-to-follow. It doesn't require much thought, which in itself is great, because it doesn't overwhelm your mind and you can just enjoy watching the series. Let's be reminded that this anime is intended for the viewing of children. I watched this series about 3 years ago, in 2010 and I was about 11 or so. I loved the art at that time! It was cute, sweet, and oh so adorable. As I rewatch the series now, okay the animation isn't the greatest. Many of the frames are plainly drawn, and only the actual animate objects in the frame are in immense detail. That's okay. Your eyes are supposed to be drawn to the main point on the scene anyway. Regardless, Yumeiro Patissiere demonstrates an intensive amount of work in their backgrounds/scenery, which helps set the atmosphere and obviously the enjoyment. Sweets are animated with care, which just showcases the whole point of the anime in the first place. I have to be honest, the soundtrack to Yumeiro Patissiere is very well done. In my opinion of course. The OST is done beautifully, with about 30 tracks of different background pieces. The composition is very pleasing to the ear, and matches the anime correctly: soft and emotional during the slow parts, and adamant and upbeat during the intense, happy parts. The main theme song "Yume ni Yell! Patissiere" by Mayumi Gojo has an almost sparkly feeling, which suits the anime well. No less, "Ichigo no Miracle" by Sugihara Yukina is a repetitive catchy tune to close each episode. The characters of Yumeiro Patissiere follow the same pattern most shoujo anime take. Depending on your type of anime, this can be a good or bad thing. Amano Ichigo is they typical happy-go-lucky, always so darn optimistic, clumsy, dense heroine. She overcomes obstacles through hard-work, though sometimes it seems almost magical that she can actually pull stuff off. Like usual, she's got guys falling head over heels for her, and she can't tell. Ichigo suffers from being the ultimate stereotype of anime; which in a sense can get very repetitive and annoying. The sweet princes are fairly stereotypical as well, though thankfully, the anime does try to get into their past and family life a bit. Hanabusa Satsuki is the typical "prince" character, or the one that the heroine is should like more, but never ends up growing so close to the point of falling in love. He's on the verge of narcissistic, showing concern toward his own appearance. Though, he is very sweet when it comes to Ichigo, treating her very kindly, because of his self-goal to be kinder to women. Andou Sennosuke is the second sweet prince, probably the one who's character depth is the least explored. He's calm, often trying to prevent fights. He's the typical "geek" character, but less of a geek and more of just intelligent. Finally, Kashino Makoto, who personally is my favourite character in the series. Kashino is that prickly "jerk" character that the heroine always hates. And to be honest, it's quite obvious why. Kashino is rude and insensitive at the beginning of the series, often scolding and teasing Ichigo for her mistakes. However, his character does develop, and it becomes obvious that he plays an important piece in a 'wanted-to-be-but-didn't-work-out' love triangle. Despite their over-stereotypical personalities, your heart can seem to connect with the characters in some way, which is the whole point of their existence. Thus, the appropriate scoring is given to them. Okay, so maybe this is a little bit of a stretch; especially biased for me, since I watched this maybe 3 years ago and I was a child. I still am, basically. Yumeiro Patissiere was one of those animes that grew on me, partly because I had to sit on my hands and wait every Saturday for the newest episode to come out. I'll admit, Yumeiro Patissiere had me on the edge of my seat during the exciting bits, feeling empathy towards the characters, cooing over the cute moments, and overall just left me with an immense feeling of joy when I watched them. Thus, the perfect score. This story is really geared towards a younger audience. The themes that they show are very sweet and educational. The MCs teach the audience how to work together, how to fail and try again, how to enjoy what you have, etc. The story was great. It was cute and fun to watch. The characters weren't boring and didn't have similar traits at all. They all had their unique personalities. As for the sound and art, I'm not really a good judge of that. All I can say is that I have no complaints. It is a really enjoyable anime to watch on your leisurely time. It is fun and quite long but the story doesn't get boring at all. It isn't the type of show that shows a similar repeat like pokemon or other competition based type shows. Even though they do go into multiple sweets competitions and have multiple competitors, but each one shows a different scenario, different sweets, different new characters, etc. Overall, I would recommend it if you have the time to watch this anime. Yumeiro Patissiere is an interesting anime that got me hooked up in the first few episodes. It tells about how a clumsy girl, Ichigo that doesn't know anything about being a patissiere achieving her goal and becoming one of the best patissiere in the academy. She achieves her goal with the help of 3 princes in her class which has the best grades in that year. Ichigo even has her own Sweets Spirit on her first day when she arrived at the academy, the 3 princes also has Sweets Spirits that help them become better Patissiere. Overall, I really enjoyed the anime, I was interested on how she was trying so hard to achieve her goal as a Patissiere so she can go to Paris and study at that academy. I really like how all the sweets in the anime look so cute and delicious making me hungry.